Take a bus to reach the municipality of Bela pod Pradedem (the Bela - zotavovna bus stop). 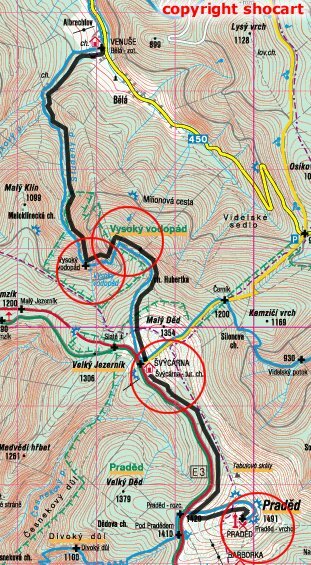 Heading along the stream of Studeny potok, follow the blue trail along the tarmac road that later on turns into a firm forest road. After some 3 km, you enter a preserve. Still marching alongside the stream, you can admire a myriad of small waterfalls and cascades. After half a kilometre you come to the waterfall of Vysoky vodopad (45 metres), then continue all the time up the hill. The rocks above you are towering as high as 60 m. After some time of steeper climbing you arrive at the top of the rocks. The view here is not really appealing, because the valley which you are now in is very narrow and the view is blocked by trees. Continue up the steep hill, crossing the tarmac road leading from Videlske sedlo to Cervenohorske sedlo; it is called Milionova cesta. The gradient drops off a short distance above the crossroads. You now arrive at a tourist chalet called Svycarna, where refreshments might be in order. From this point, the mountain top of Praded, which can already be viewed in the distance, is a mere 3.5 km away. The trail is moderately difficult except for the 500 m section leading from Vysoky vodopad up the hill, which is rather challenging. From Svycarna or Praded, you can continue either to Cervenohorské sedlo or in the direction of Ovcarna, where possibilities again become more diverse, and include continuing along the Bila Opava nature trail as far as Karlova Studanka, taking the nature trail leading through Velka Kotlina to Mala Moravka, or going via the mountain top of Vysoka hole, and so on. To learn more about other options, please visit the Tourism section. Note: cycling is prohibited within the Vysoky vodopad to Svycarna section.